There is no question that the chinook salmon is the king of Pacific northwest coast saltwater fly fishing. 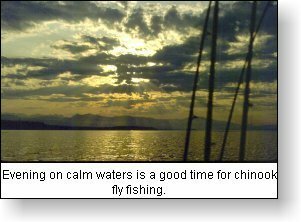 Now that fly fishers have been successful targeting, hooking and boating (beaching) coho and pink salmon they are talking about the �how to' for chinook fly fishing. Recognition of the chinook salmon is unique in the angling world. Rather than a name associated with shape or color such as 'humpy' for male pink salmon, a reference to the physical dorsal hump, or, �red' for sockeye salmon, a reference to their spawning color, chinook salmon have names for their size. 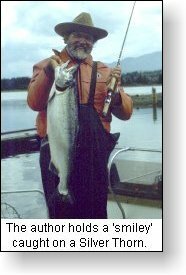 A small chinook is called a �Jack' while a chinook over twelve pounds is called a �smiley'; the there is that trophy a chinook over 30 pounds which is called a �tyee'. 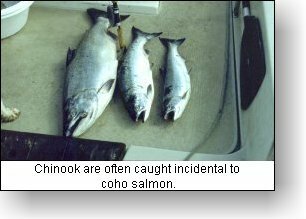 I have many memories of hooking chinooks on the fly but, except for the rare situation, all my experiences have been incidental and have occurred while I have been targeting open ocean feeder coho. Unlike the flashy coho salmon, chinook salmon are deep water salmon. Their regular feeding habits place them at depths which are virtually impossible for the fly angler to reach most of the time. But, there are times, key periods when they will feed near the surface where they can be successfully hooked on a regular basis. Location is the key to their surface feeding activity! Young schooling baitfish concentrate in sites where they are able to find safety, usually kelp beds and shallow shoals. These locations tend to be at the southern tips of coastal islands or along coastal ledges. Here the baitfish hold, often coming to the surface and feeding during certain tidal periods. These are usually know fishing holes and are often easily located by concentrations of sports boats. 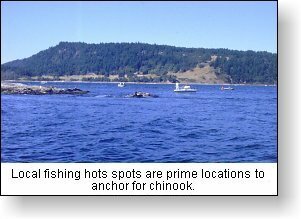 For the fly fisher these locations offer many opportunities for anchoring in shallow zones to intercept chinook movement in the area. My experiences have taught me that there is no preferred time but there does appear to be one predictable salmon feeding time during each day's lowest tide. I have found that the baitfish will concentrate near beach rocks, kelp beds or shallow shoals as the tide ebbs. Chinook feeding seems to persist through the ebb tide to slack and then only for a short period into the flood. It should also be remembered that single chinook will feed at all tide change periods. Also, early morning and late evening are acknowledged chinook feeding times. Chinook salmon are deep water fish. They are not surface fighters and usually sound, diving as deep as they can when they have been hooked. But, there are exceptions and it is to these shallow water fish that the flyline casting salmon fly fisherman should target. It should be noted that deep water can sometimes be reached with what I would call unconventional fly fishing, the throwing of monofilament lines with attached weights. However, I have never enjoyed stripping monofilament line through my fingers on the fly retrieve. It is likely that this unconventional method will provide some improvements which will help the conventional fly fishing flyline caster. Due to the depths most chinook feed I find a weighted fly along with weighted shooting head fly lines in the #10 and #11 weight give me the opportunity to sink my tackle quickly before the tidal current bellies my line. My rod preference is in the 8 weight class and the 10 foot length for all Pacific salmon. I make a point to fight all salmon from the reel and load at least 200 yards of backing on all my reels. Tide movement can best be likened to river currents and requires river fishing skills of mending and flotsam evasion for the fly fisher to get his fly down to the salmon. But, unlike steelhead river fishing where the dead drift is the principal fly presentation, with chinook salmon fly fishing, the take usually only occurs during the strip retrieve. The take of these heavy fish is memorable! On your slow strip retrieve, and I emphasize slow for I have found that any other retrieve rarely takes a fish, your line will simply halt as if you have struck a solid snag. Be prepared, clear the line at your feet, brace yourself, then be ready for a long long run! I have always been surprised at the lengthy moments of time these fish will give me when I first strike them. It seems that there is that eternal pause, that utter stillness and quiet, time to clear my thoughts and prepare for what I know will be a lengthy struggle from a most exciting and challenging opponent. Following is the one fly pattern that I have found most effective for chinook fly fishing. It can best be described as a concept fly, one of those basic patterns that has many options. On the wall of my study I have a fly case which has 28 different Silver Thorn versions, all having hooked salmon in the saltwater. 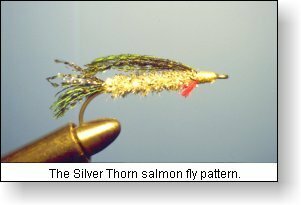 Like all my salmon patterns the Silver Thorn is based upon sleek silver simplicity - an imitation of baitfish targeted by Pacific salmon. Using the basic pattern listed above, I have tried numerous variations to the basic pattern. All those recommended below have taken both coho and chinook. lead eyes, with white paint. A separate fly box of weighted flies is necessary under most conditions to help counter the effects of currents and take the fly down to the magic 20 to 40 foot salmon depth.